The donations detailed in this post have been provided by some incredible brands. We have not been compensated in any other way. Last year, we hosted a big “Doggie Coat Drive” to benefit two Brooklyn, NY rescues. It was a huge success and we were able to donate hundreds of coats, sweaters, treats, and toys to these two very deserving organizations. This holiday season, I decided to switch it up a bit. The rescue that pulled Henry from euthanasia (A Love For Animals, aka “ALFA,” in Jonesboro, Arkansas) is a small rescue with limited funds. In addition, they often post on Facebook, alerting followers that their food supply is low and pleading for donations. The fateful day I met Henry! If you aren’t familiar with Henry’s history, I have the full story on the blog. In short: A Love For Animals pulled him from “death row” at the local pound. They eventually transported him to Sean Casey Animal Rescue in Brooklyn, NY where he could receive needed medical care for a leg injury and heartworm. That’s where I fell in love with him! Henry is only alive because ALFA saw his potential. To thank them for quite literally changing my life by saving Henry, I decided to surprise ALFA with a big holiday food, treat, toy, and supply donation so they could save more pups in need! I called this top-secret surprise drive “Operation ALFA,” and reached out to several of my favorite brands and brand reps. Thus, this TOP SECRET OPERATION was born! Reach out to brands for donation commitments. Assemble a “teaser package” to send to ALFA. Post a video thanking ALFA and detailing the donations on December 13th on Facebook, Instagram, and in a blog post. Finally, have brands ship donations to ALFA after the surprise is revealed! The week before the video launched, I shipped a box to A Love For Animals, complete with seasonal dog treats and holiday toys as well as some festive chocolates for the humans. Most importantly, it also contained a note encouraging them to check Facebook on December 13th. Finally, on the 13th, this post went live — as well as the video on both Facebook and Instagram! Of course, Operation ALFA would be nothing without our fabulous sponsors! A huge thank you to the following brands for participating — and please remember them while you do your holiday shopping! 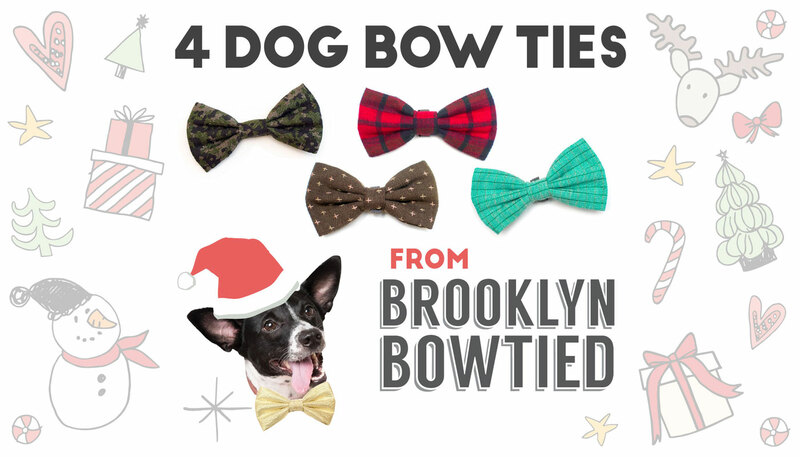 Brooklyn Bowtied is donating 4 Dog Bow Ties! Brooklyn Bowtied is actually me and Henry! We make stylish dog bow ties inspired by current fashion trends. Each bow tie is lovingly handmade and double stitched to stand up to rugged playtime. I hope ALFA can use these bow ties to help their pups look extra-adoptable! The Honest Kitchen is donating $100 of their Cuddles and Nice Mussels treats! This innovative company makes delicious human grade meals for your pet, as well as fun and quirky treats — including their new Pumpkin Spice Latte mix for pups! 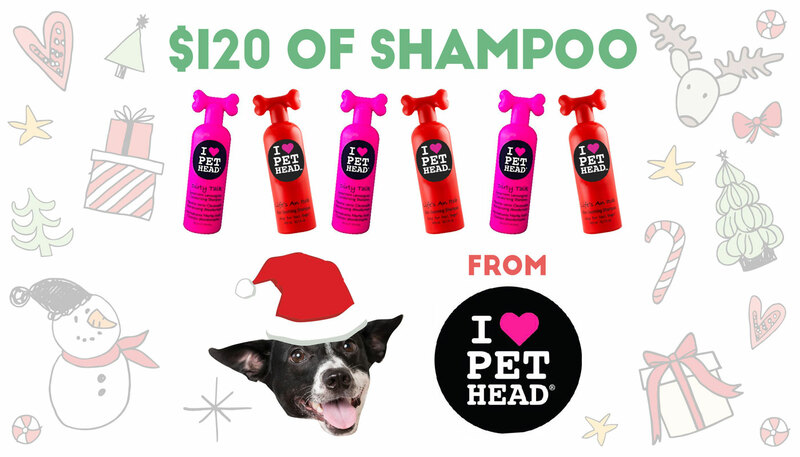 The Company of Animals is donating two full cases of Dirty Talk and Life’s an Itch shampoo! Available exclusively through The Company of Animals, the Pet Head grooming line for dogs is edgy and fashion-forward. The product line features shampoos, rinses, wipes, and sprays with vibrant packaging designs and colorful names. HandsOn is donating 5 pairs of grooming gloves! ($149.95 value) According to the company, HandsOn Gloves are a revolutionary concept that reaches far beyond the traditional curry combs, mitts and scrubbers on the market today. Wet or dry, they won’t slip or fall off while providing you and your pooch with a more thorough and enjoyable bathing and grooming experience. Caru Pet Food is donating four cases of Daily Dish Stews! ($140 value) Made in a human food plant in the USA and with 100-percent human grade ingredients, Daily Dish Stews look, smell, and taste like a home cooked meal. They’re made with non-GMO ingredients and do not contain any wheat, gluten, soy ingredients or animal by-products. In addition, they’re packed in 12.5-ounce Tetra Pak cartons, BPA-free sustainable packaging that keeps the stews fresh without preservatives. Learn more in our review! Fresh Wave is donating 10 Fresh Wave Odor Removing Gels! ($149.90 value) These gels work by releasing Fresh Wave molecules into the air, outnumbering those bad odor molecules. Best of all, they’re safe for people, pets, and the planet: Fresh Wave products are made from simply water and natural extracts of lime, pine needle, aniseed, clove, and cedarwood. Barkworthies is donating $172 worth of treats and chews! Barkworthies strives to give dog lovers access to the highest quality chews and treats without additives, preservatives, or artificial ingredients. They’re going to be sending a big variety of chews, including: Beef Esophagus Cane, 6″ Odor Free Select Bully Stick, 12″ Odor Free Select Bully Stick , 6″ Odor Free Butcher’s Cut Bully Stick , 12″ Odor Free Butcher’s Cut Bully Stick, 12″ Beef Trachea, Long Curly Bully Stick, Odor Free American Bully Stick 12″ Twisted, 12″ Odor Free Bully Sticks (3-pk. ), Lamb Ear (10-pk. ), and more! We put a call out to our friends (while still attempting to keep the mission top-secret!) to see if anyone would be interested in contributing monetarily. Their generosity was inspiring, and we’re thrilled to be able to send ALFA a $125 Visa gift card to use for food, supplies, or vet costs. The following three sponsors are our TOP DOG SPONSORS! These brands donated the highest monetary amount of product. A round of applause, and please keep them in mind when doing your holiday shopping! Wellness Pet Food is donating an incredible $3000 of product! Wellness is committed to creating delicious recipes that use simple, natural ingredients—without any fluff or fillers. Henry loves their kibbles as well as their treats, and we are so grateful for their generosity. You can learn more about some there products in these posts. Weruva, makers of Henry’s favorite canned food, is donating an amazing $500 worth of dog kibble! This great company makes delicious food for cats and dogs, as well as kitty litter. Furthermore, their formulas are produced in a human food facility using many of the ingredients and processes that are used in products made for people. KONG is donating 100 of their “KONG Cares” toys! KONG Cares is a program that KONG developed to provide slightly imperfect (but still usable!) toys to rescue and shelter organizations at a fraction of the retail price. Each KONG Cares toy costs an average of $2.56, placing this donation at approximately $250! Check out the video we made below! A HUGE thank you to all of our wonderful sponsors and supporters, as well as A Love For Animals for saving so many animals’ lives. Henry and I hope you have a wonderful holiday season and New Year! AMAZING! This brought me to tears. THIS THIS THIS is what the season is all about <3 Congratulations on pulling this off and thanks to all the generous donors of food and supplies. Aww what a beautiful way to give back . So generous! I bet they will so appreciate the donations. So glad Henry was saved by you too. You have the greatest gift and paying it forward. Love the cute video too…high five! Happy Holidays. I have 6 pets saved from death row. Reading and watching this wonderful post made my heart so happy! The world is a better place because you and Henry are part of it. What generosity! It’s wonderful that the rescue will get such marvelous treats and gifts from so many generous people and companies. Thank you for paying it forward – it’s crucial for small rescues to continue to get community support so they can continue with their work long after you’ve taken your rescue home. That is amazing, and I love the video! Thanks for giving back and helping other awesome dogs. This just brought tears to my eyes. What a wonderful way to give back at the holidays to help a rescued. Rescues work tirelessly to save animals and they so deserve this recognition. Well done! This is so wonderful! To see so many sponsors be so very generous. WOW. It really reflects the season for sure. Well done and kudos to all involved. Keeping it local is also wonderful! Well done! This is amazing. Those sponsors are so generous and thank you for putting it all together! You are so amazing I literally had tears in my eyes reading about what you’ve done for animals in need. I believe there are many people who would love to help but aren’t quite sure what to do or where to start. You have shown all of us how much one person can make a difference, and create a wave of giving that just doesn’t end. Yay! What a wonderful surprise for this rescue. I’m sure they are over the moon excited to receive such an amazing gift, and I know their animals will appreciate it as well! Wow, simply without words! What is this moisture on my eyes and face? TEARS you made me cry! How generous! THIS is what the season is all about. A HUGE thank you to all the amazing sponsors the brands, The Broke Dog, all of you and you, for doing this! I am sure it took a lot of work and preparation. I want to be you when I grow up! Geesh! Amazing! Just beautiful!!! The shelter animals are going to have a fabulous holiday! Great job lining up sponsors and keeping the whole thing under wraps. Wow, this is amazing. Thank you for giving back so much to support shelter dogs! I am SO PROUD of you! This is incredible that you pulled this all together (secretly). And WOW to all the sponsors especially Wellness – $3,000 worth of food will last a long time for a small rescue and maybe even allow them to rescue a more dogs like Henry from the pound. And of course, your video and photos are adorable! You two are pretty much the cutest pair ever! AMAZING!!! What a fantastic idea. I’m so glad ALFA saved your Henry, and love that you and Henry are pawing it forward. It’s wonderful that your sponsors are also supporting this good deed. I am amazed at your creativity it took to put this together, the wherewithal to see it out, and the talent to make it such a success. Kudos!